Hi Everybody! How are you all? I'm wondering if you're charging into this holiday season like a crazed maniac...? I certainly am! It seems that there is always so much to do and so little time to get it done in. I've been trying to get some handmade gifts done. I stayed up late last night and cut wine bottles so that today I could pour candles into them. I've only gotten a couple done but I'm happy with how they are turning out. I need to buy more wax so I can keep going and get the rest done. Anyhow, I'll post a picture of those after the wax sets. 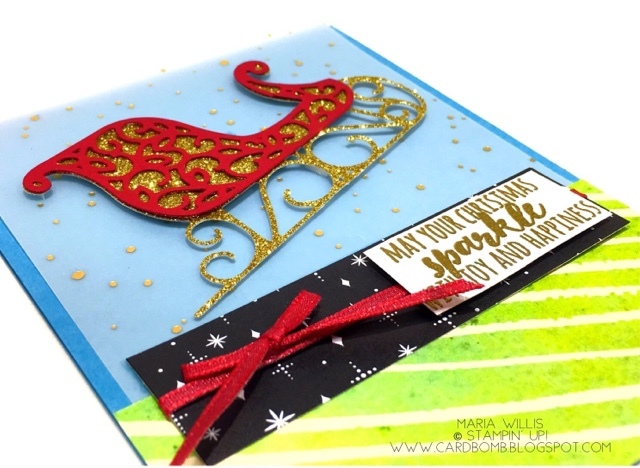 I sadly don't have these gorgeous sleigh thinlits... but lucky for me one of my downline does. I went over to her house for a little craft fun and she was kind enough to share with me. I used gold glimmer paper behind the detailed Real Red piece of the sleigh. I love how magical and sparkly it looks. I need to get back to my gift making as I am determined to finish my gifts on time (early even) so that I can relax and enjoy my family and friends this holiday season. However busy you all may be I'm wishing you the sparkliest, happiest of holidays from the mountains of California, USA. Want to shop with me? No problem, just click the button below. Want a great discount on Stampin' Up! Products and to have a fun new stamping family? Join me on this fun adventure! I can't wait to be your super excited Stampin' Up! side kick and support lady! In case you didn't know, you can join Stampin' Up! just for the discount and never sell a single product. If you want to know the details just let me know. If you're looking for a discount on your favorite hobby (stamping and paper crafting with Stampin' Up! products) and want to earn money doing it... let me know! I'd love to talk with you whatever your interest might be! If you want to see a little more info go ahead and click the button below. Looking forward to hearing from you! Thank you Sylvia! I'm so glad you like it. Happy holidays!